LINCOLN, NEB. 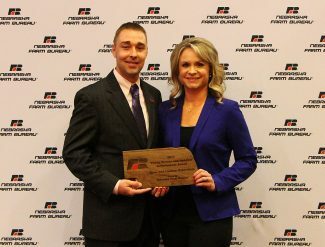 — Ryan and Lindsey Ueberrhein of Elkhorn were honored as Nebraska Farm Bureau's 2017 Young Farmers and Ranchers Achievement in Agriculture award winners at the Nebraska Farm Bureau 100th Annual Convention on Dec. 5 at the Younes Convention Center in Kearney. 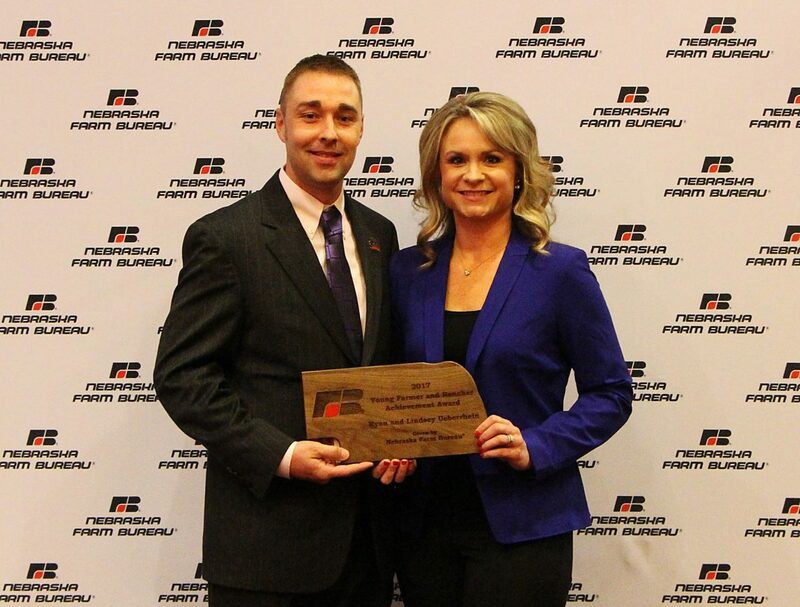 Farm Bureau members 18 to 35 years of age apply for the award. 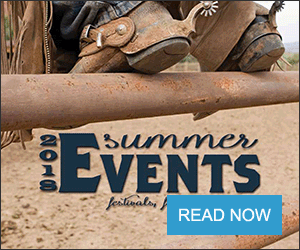 The Ueberrhein's were selected on the basis of performance in farm or ranch management, setting and achieving goals, overcoming obstacles, and service to the community and Farm Bureau. Ryan and Lindsey farm near Valley, Neb., in Douglas County, where Ryan grew up. They grow corn and soybeans on approximately 1,800 acres. Ryan also helps his Dad John with his greenhouse business, State Street Greenhouse, where Ryan helps when needed with selling flowers that are grown out of the greenhouse and sold at a farmer's market in the metropolitan city of Omaha. Ryan is a 2010 graduate of Southeast Community College with an Associate of Applied Science degree in Fire Protection Technology. Lindsey earned her cosmetology license from Capitol School of Hairstyling in 2005. Lindsey works full time as a self-employed hairstylist in Omaha. 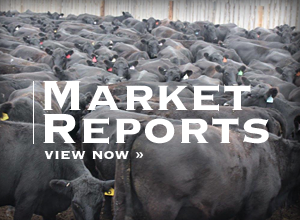 The Ueberrhein's balance busy schedules with farm life, volunteer activities and with Nebraska Farm Bureau. Ryan started farming part-time in 2009, renting his first 30 acres and using his Dad's machinery in exchange for labor on the family farm. In 2012, he formed a partnership with a friend who couldn't farm anymore due to a traffic accident. "This allowed us to grow our farm to more than 1,000 acres. Since 2013, I have been able to add newer equipment with the latest technology available. I was also more involved with my parent's farm, converting 208 acres of dryland to irrigated and putting up two center pivots. I built a shop with my dad, so now, I could do most of the equipment repairs myself," Ryan Ueberrhein said. In 2017, things changed dramatically for the Ueberrhein's, Ryan's mom, Karen passed away and his Dad turned a majority of the day-to-day farming operation over to Ryan and his younger brother Jason. A neighboring farmer decided to retire, allowing Ryan to add approximately 500 acres to the current operation. "For us to obtain optimum profitability, we use special software to manage input and operational costs, allowing us to develop specific cost per acre to obtain the highest efficiency for each acre, I do most of the grain marketing myself, but I do rely on guidance from a marketing firm to help with the fast changing domestic and global markets," Ueberrhein said. The Ueberrhein's currently are serving their second term on the state YF&R committee, representing the Southeast district. Ryan also serves as vice president of the Douglas County Farm Bureau board. He was appointed to the State of Nebraska Beginning Farmer Board in 2015, serves as an EMT/Firefighter for the Valley Fire and Rescue department and is vice president of the department. As winners of the Young Farmers and Ranchers Achievement Award, the Ueberrhein's will receive a $500 cash prize and an all-expense paid trip to the 2018 American Farm Bureau convention in Nashville, Tennessee, in January, where they will compete in the national contest.